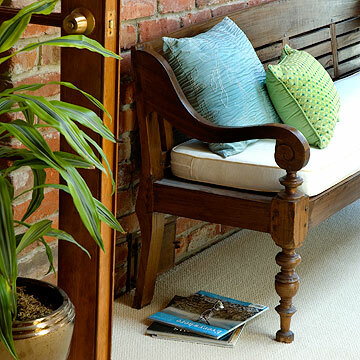 Try these 10 clever ways to add personal style to your home. Dorothy was right when she said, "There's no place like home." But there's really no place like a home that's inviting and reflects your personal taste, according to a recent survey of Motherboard Moms. That's why we've collected these fun and thrifty ways from Jennifer and Kitty O'Neil (ONeilSisters.com) to help you give your home personality-plus! Add a fresh and whimsical touch to your home by displaying a collection (or two). 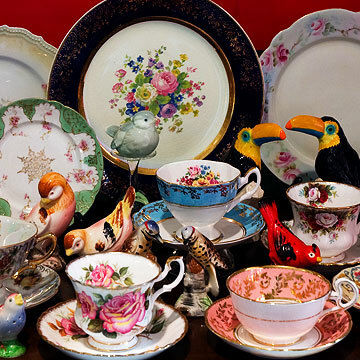 We think this flock of ceramic birds looks sweet perched among flowery teacups. Any collection mix-and-match will do: Contrast your vintage clocks by arranging them with your hula nodders. Or merge your Fiestaware with your state glass collection. Give your bath decor a lift with a footed cake plate. 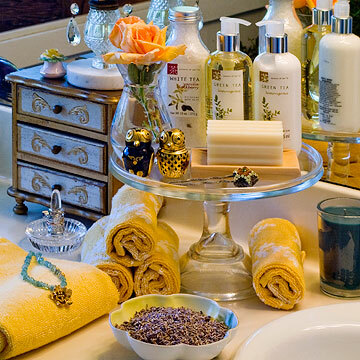 Set soap, lotion, and bath salts on top and tuck rolled washcloths underneath. When you put everyday items on a pedestal, you make the ordinary extraordinary. Remember Grandpa's excruciating slide shows of his vacation? No more! 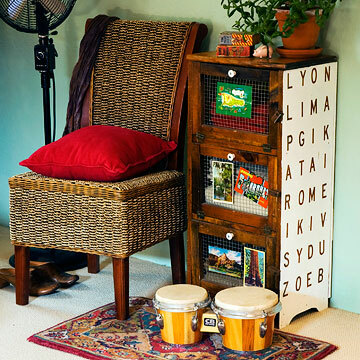 You can make your own personal statement at home and remember your vacation in a more modern way: Turn a cabinet into a travel display by customizing it with postcards and photos and adding meaningful words. We created a word puzzle of favorite travel destinations on this cupboard by applying stickers, painting over them, and peeling them off. I spy ROME! If travel's not your thing, try the sticker-paint trick to spell out family names or favorite desserts. Why spend money on meaningless decorator accents when you can shop from your own hobby? 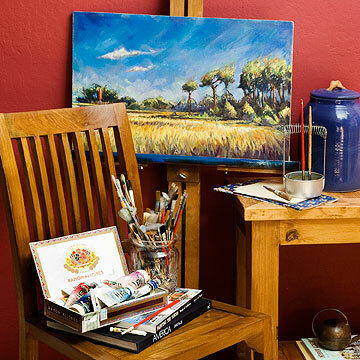 Whether it's the quilt you're stitching, your music stand, or a painting in progress, display your interests. The accoutrements are designer chic! For an instant makeover, think color. Your favorite colors are green and blue? Go for it! The way you combine your fave hues is as individual as you are. 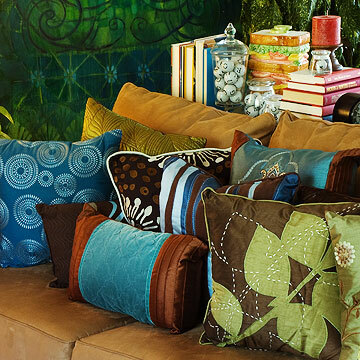 One easy (no painting) way to spread some color around is to pile on some pretty pillows. Mix (don't match) throw pillows in the same color story for a fresh and lively look that has a lot of impact without being expensive. Rather than settling for a generic table or chair, consider something with a little personality. A hand-carved bench from Bali does the same job as a mass-produced one, but with an exotic foreign accent. Likewise, great-grandma's armoire warms up a room with a patina of family memories you just can't buy. Set your decorating apart by creating small surprises. Balance a signed baseball on a crystal candlestick or hang a skeleton key from a drawer pull. Here, a mini chair is not only unexpected on top of a table, it's a perfect platform for a still life under glass. 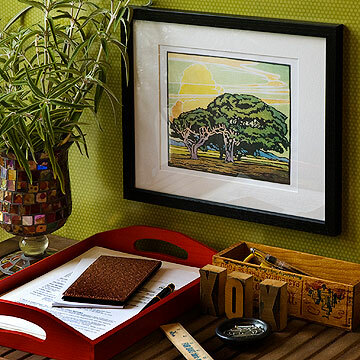 See what kind of scene you can create from items you have around the house. Love fine art? Wish you could afford it? You can! Buy a book of fine art prints from your favorite artist and then (gasp!) cut out a few pages and frame them. It's high art at a down-to-earth price. 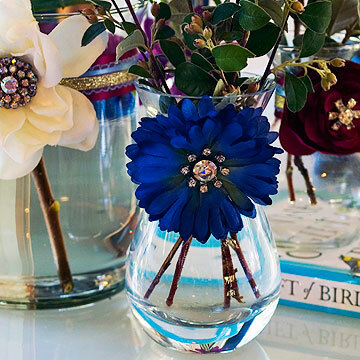 Take store-bought accessories from blah to ooh-la-la! Plenty of stores have aisles of home accents just begging to be jazzed up. Try wrapping simple vases with layers of ribbon. Then embellish each one with a rhinestone brooch and a silk flower. With a little craftiness (and hot glue), you can transform anything to make it yours. There's nothing more personal—and special—than your child's artwork. But instead of posting these creations on the fridge like everybody else does, exhibit those priceless works of art more formally. 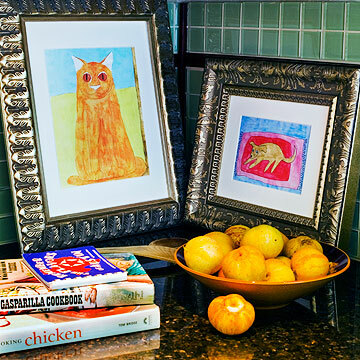 Have each of your kids paint a portrait of your pet. Then mat and frame their masterpieces as you would a Picasso. They'll be the darlings of the art world!